Smudging in the modern era has been incorporated into many rituals and spiritual practices such as meditation or purifying a home. Smudging rituals are regarded by their practitioners as psychologically and spiritually cleansing, and a means to clear negative energy. Smudging is a Universal practice known to religions throughout the world. Buddhist temples use incense sticks, Catholic churches use Frankincense, Native Americans use sage and other herbs before every ceremony to be centred and focused for what follows. The smoke is ‘washed’ over the person or object. 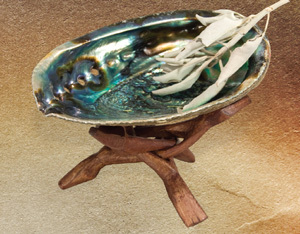 When smudging, put the material of your choice in a shell, clay pot or other non burnable container. Light it, allowing it to burn for a few moments. Fan out the flames; it is the smoke of the smouldering herbs or incense you want. Using your hand or a feather, spread the smoke all around yourself first, then over what it is you are cleansing. Next, walk about the area, person or object you are smudging, fanning the smoke. This clears negativity, cleanses, focuses and purifies that which is being smudged. Quick short fanning movements break up blocked or stagnant energy, long flowing movements smooth out energy, creating a calm, balanced and harmonious energy flow. To do a blessing of a person, begin by looking into their eyes for a moment to ‘greet’ them, fan the smoke first at their heart and then clockwise around the body; head to toe and front to back. For objects, bless them moving clockwise around them as well. Crystals and tools for healing can also be cleansed by smudging. When smudging a room, make sure you get the smoke up into the corners and open doors or windows to let energy escape if the area feels heavy or there has been sickness. Once you feel the smudging is complete, wait for a day or two. If you feel you need to smudge more, perform your ceremony again. You may then want to smudge with sweetgrass. A general rule of thumb is sage is for clearing and healing, sweetgrass is for attracting new energy. Sage Used to bless, cleanse and heal the person or object being smudged. Use it to ‘wash off’ the outside world when one enters ceremony or other sacred space. Cedar A medicine of protection, often used to cleanse a new home and protect from unwanted spirits or influences. Sweetgrass For attracting new energy. Its sweet, vanilla-like scent is used to sustain the effects of smudging. Frankincence Considered to cleanse and protect the soul, it was once used to embalm the bodies of Egyptian Pharaohs and also said to ease depression. Myrrh Said to clear the path to truth and help maintain a state of enlightenment. It also connects one to the spirit of youth. Lavender Used for the invitation of spirits and also thought to be a safeguard against evil. Visit our smudge category to select smudging supplies that appeal to you!